If you have a hot tub, then you may need hot tub accessories to increase your useage and enjoyment of your spa. You may also need hot tub parts or a spa service technician to repair your spa. New spa owners may also need help in moving the spa, finding a local electrician to install the spa or receiving information about using the spa. Popular hot tub accessories include hot tub steps, covers, cover lifters, toys, ozonators and filters. 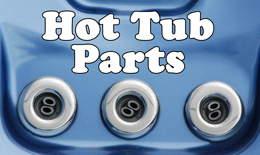 Spa parts needed to keep the hot tub running may include a new pump, heater, jets, filters, PVC plumbing parts, circuit board, spa packs, fuses, light bulbs and more. Water maintenance chemicals include bromine, chlorine, pH plus, pH minus, foam away, test strips, spa shock and more. Finally, some hot tub owners decide it is time to upgrade and replace a spa that is more than 10 years old. In any case, we hope you will find the hot tub spa tips and supplies that help you enjoy your hot tub! Buy a quality, discount hot tub cover online and get FREE shipping in the U.S. or Canada. Spa filters should be washed out every couple of weeks and should be replaced every year for optimum spa water filtration. A hot tub pergola, privacy screen, gazebo or other decking material can help create the perfect space for your spa.